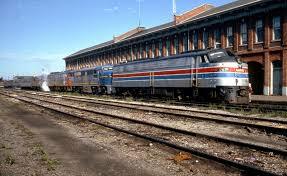 Amtrak came into existence on May 1st, 1971, through the Rail Passenger Service Act. The Act authorized the newly formed National Railroad Passenger Corporation to manage and operate an American national rail network. Amtrak was organized to revive dwindling rail travel, as cars and planes became more popular. It was the first unified, centrally-managed, nationwide passenger service in the United States. From the beginning, Amtrak’s focus was a balance of affordability and luxury, as it had to compete with planes and cars for both comfort and cost. Amtrak was assembled from twenty different companies. Management began by renovating passenger trains with new heating and lighting systems, and ordering a new fleet of faster cars. They also bought many train lines in the 1970s, as smaller companies went bankrupt or joined the consolidated system. For instance, in 1976, Amtrak took over the bankrupt Penn Central; this made Amtrak part of the Canada Southern Station’s history. The station was part of Amtrak’s route between 1976 and 1979, eventually being abandoned when the states of New York and Michigan withdrew their subsidies for the operation. The Amtrak train that stopped at the station was the Niagara Rainbow, which was known as the Empire State Express when it was still operated by Penn Central. Amtrak continued to expand in the United States, and refurbished old lines and renovated stations. In 1976, for example, Amtrak took over the Northeast Corridor, and undertook a massive revitalization program. Many states offered subsidies to Amtrak and helped make the United States’ national consolidated railway truly national. The 1980s continued to see Amtrak focus on covering more of the United States. Sleeper cars were upgraded and many trains gained dining cars and lounge cars with movies and large viewing windows. Amtrak continued to grow throughout the 1990s. Just over 30 million people a year are traveling by Amtrak trains, and the company experienced over $2 billion in revenue.